All contest entries postmarked by March 31, 2014 will be accepted. In order to raise awareness of rainwater harvesting and promote the use of RainSaucers™ as a tool for collecting rain, we are launching today our 1st Annual "Saucers for Schools" Art Contest. 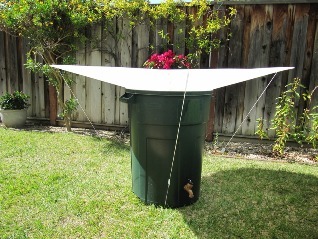 All students in grades 3-5 in an Elementary School in the United States (and territories) are eligible to win a 59"RainSaucer + DIY Standalone Rain Barrel Kit ($85 Value) for their School Garden or Campus. There will only be one winner per Grade as judged by the Management of RainSaucers Inc.
• The artwork must be 2D, with nothing stuck to it. • On the back, please include name (first and last), title of the artwork, name of school, school's address, student's grade (3-5), teacher's name and email address, parent's name and email address, and home address. San Ramon, CA 94582 with a postmark date no later than March 31, 2014. • Results will be announced on our blog on April 10, 2014. All students and teachers should review the rules and guidelines carefully. We will not accept entries that are delayed or do not follow the guidelines. Questions can be asked via our Contact page. By submitting an entry to our Art Contest, the artist agrees that the artwork becomes the property (including all copyrights) of RainSaucers Inc.
Prize: Each winning artist selected will receive a certificate of recognition and their School will have a 59" RainSaucer and DIY Standalone RainBarrel Kit mailed to them in April. Please note: barrel is not included.